Sisal fiber is exceptionally strong and durable and is one of the most hard-wearing natural fibers. It does not absorb moisture easily and resists saltwater deterioration so it?s an excellent option for seaside home decor. Sustainably harvested in Southern China where the hot, dry climate offers perfect growing conditions. 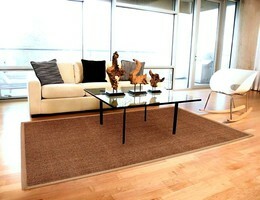 Machine woven 100% Boucle weave Sisal. Pile: Khaki cotton border with mitered edges and non-slip latex backing. Vacuum regularly. Spot clean with a damp cloth. You may use a solution of mild dish soap and water but test the solution in a small, inconspicuous area of the rug to be sure there is no discoloration. For liquid spills, blot?do not rub?with a clean, dry, absorbent cloth. If you choose to clean the rug yourself we recommend Host®, which is a highly rated dry extraction carpet cleaning system which works very well with natural fiber rugs.